It’s a bad news/good news time for Disney fans right now. On the bad news front, Sleeping Beauty & 101 Dalmatians are being retired to the Disney Vault, off sale for at least 7 years. But the good news, flying out of the Vault and on to shelves on July 1, is Dumbo. It’s been 70 years since the first cinema release of Dumbo, and it has received all the care and attention due a classic of its standing. Restored, and digitally enhanced, frame by frame, taking over 6 months to finish. This will be the best version of Dumbo you’ve ever seen or heard. Dumbo was the fourth full-length animated feature from Disney, and was its most financially successful film of the 1940s, a return to fiscal form after the (astonishing) flop that was ‘Fantasia’. 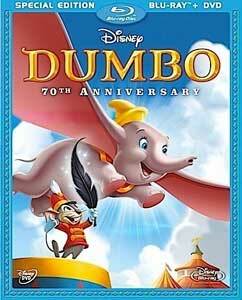 Dumbo was also Disney’s first film to be released on home video, back in 1981.